For Eleni Karaindrou the albums do not even appear in Tidal, either app or browser. In Roon, under the artist, three albums appear in the Tidal section, under Singles and EPs, which are the marked Unavailable. So no real conflict, the albums can’t be played, but why does Roon show them. Barre Phillips is different. In the Tidal app, three albums appear and are playable. All Albums, no singles. In Roon, those three albums appear, one is unavailable. Ten others appear, eight are unavailable, even one by John Surman where Phillips presumably appears. Thanks @AndersVinberg – I see the same. Will open a bug report and have a look at what’s going on here. Right now Jan Garbarek: In Dresden is marked unavailable - why? Most ECM titles though they appear in Tidal are not available in all but a few locations. See the discussion in this thread. This issue also seems to occur with the new Neil Young and Promise of the Real tracks on Tidal from the upcoming Earth album. I can stream the track Vampire Blues on Tidal via a web browser, but it doesn’t appear in roon when I search for it. I also tried creating a playlist in Tidal with two tracks :1. Love and Only Love 2. Vampire Blues, both from the Earth album, and only the first track appears in the same playlist in roon. Hi, re-opening this thread, am a brand new user. 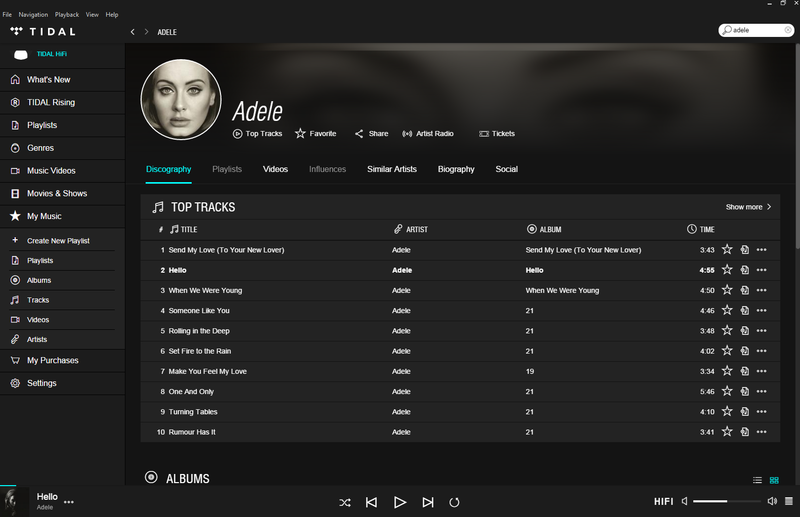 Installed Roon today… and am experiencing Unavailable tracks (in Roon) that are definitely available in Tidal. Sometimes TIDAL gives us the rights to display an album but not stream it – I can take a deeper look but that’s my guess here since it doesn’t show up on TIDAL’s website (assuming you’re in the US based on your user name). @mike ok I see, I was able to play just the track (single) Hello in Roon and Tidal, but the album 25 was not available. Fair enough. Perhaps as a new user I am still confused… was just using the very slick Roon iOS app for some mainstream listening, and ran into Library vs. 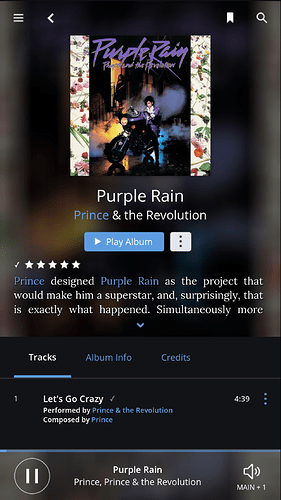 Tidal availability issues of Prince’s album Purple Rain. I am using Roon 100% for Tidal only. Why do I run into screens that tell me an album is Unavailable in Roon yet there is a version available via Tidal? Is there a way to stop this from happening. I’m sure I am missing something here. That is weird. 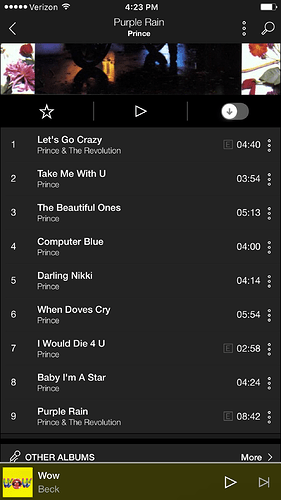 How did the Prince album get in your library originally? Added in Roon? Added via a TIDAL app? Or some other way? @mike No idea-- I installed Roon today, and have disabled external folders so whatever other music I own is not factoring in here. Hey @JayNYC – we took a look at this and it looks like there was an unavailable version of Purple Rain in our TIDAL Collections. I’m guessing that’s how this ended up in your library. Does it say Unavailable above the track in Roon or can you just not find it? I found it in Roon under her Singles and EP’s area. It is available for me to add. Hi Greg, It said ‘unavailable’ above the track while it was available to stream from a non-Roon interface. I’m based in the UK. I can play it in Australia. Try selecting the Track then Track Info/File Tags and see what the date is for tidaltrackcopyright. It can vary between countries. I don’t know why it would ever be available in Tidal but not Roon in the same country. Let’s see what @joel thinks. I run Roon with Tidal in Austria. Listening mainly to Jazz I am disappointed about the New Albums in genre Jazz. There are nearly no new albums. So I look for music with the search-function, but nearly 1/3 of the artists or albums can not be found in Roon . In the beginning I thought that this is a problem of Tidal, But if i look directly in Tidal the music is there. So if I look for new music now, I do it with my Sony NWZ, mark them as Favorit and find them on my musiccomputer later on. Any solution found for this problem? In the beginning I thought that this is a problem of Tidal, But if i look directly in Tidal the music is there. Hi @mike, has this issue been resolved? I am in the US, and very recently (May 6, 2017) added Cornell 5/8/77 - Grateful Dead, to Roon. I went to play it last night (tried all tracks) and Roon responded with “TIDAL: This track is currently not available from TIDAL”. However, all tracks play from within the TIDAL app (Mac OSX). I’d be grateful for any thoughts and apologize in advance if the answer to this is available somewhere else or in another thread. It’s playing fine for me here, also in the US. Can you try removing it from your library and adding it again? If that doesn’t work, we can take a deeper look at this.